Amazing results with only 90 seconds of treatment, 3 times a week! Hereditary pattern baldness can be very distressing to deal with, and it’s hard to find a good solution as there are so many expensive ‘cures’ that don’t work at all. But we’ve found one that really will reduce and even reverse your hair loss! The LaserBand 82 is able to revive dormant follicles to give you a huge increase in your hair coverage. HairMax products use technology that has been clinically proven to increase the thickness, growth and amount of hair follicles. The LaserBand 82 has been designed by Italian design firm Pininfarina and offers unparalleled style, usability and effectiveness. The hair band design makes it so simple and comfortable to use. Unlike other laser hair therapy devices, the comb-like teeth of the LaserBand gently part your hair so that the lasers can easily reach your scalp and get optimum results. Who is the LaserBand 82 for? 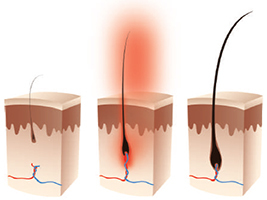 HairMax devices use photo bio-stimulation; laser energy is transferred into the hair follicle, stimulating the roots and encouraging growth. This even works on follicles that have begun to shrink and die off, encouraging them to transform back into healthy hair. 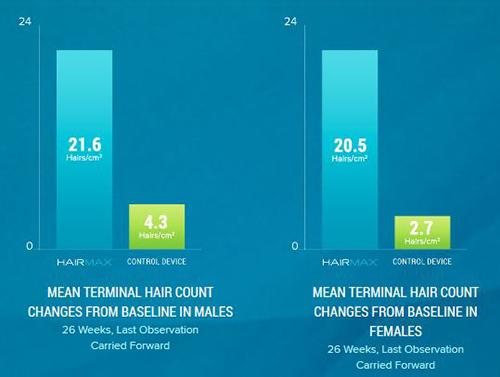 HairMax offer the only hair growth laser devices to be cleared by the USA’s Federal Drug Administration as suitable for treatment of pattern hair loss. Clinical trials have been conducted across the United States with both male and female participants. The studies involved one group being given a LaserBand 82 and the other a fake version of the device that did not have lasers in it. The participants used the LaserBand as directed for 6 months and had their numbers of thick, healthy hairs counted after 1, 16 and 26 weeks. At the end of the trial, over 90% of both the male and female groups who used the LaserBand had a significant increase in hair count. 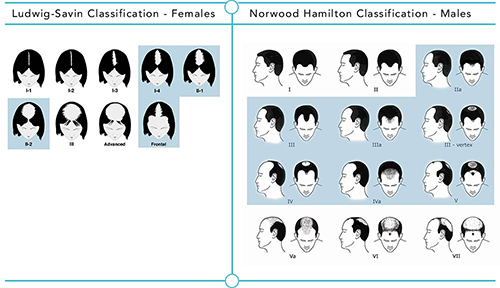 The average for men was an increase of 139.3 hairs per square inch, while women saw an increase of 132.2 hairs per square inch. Amazing results, and with no reported side effects! 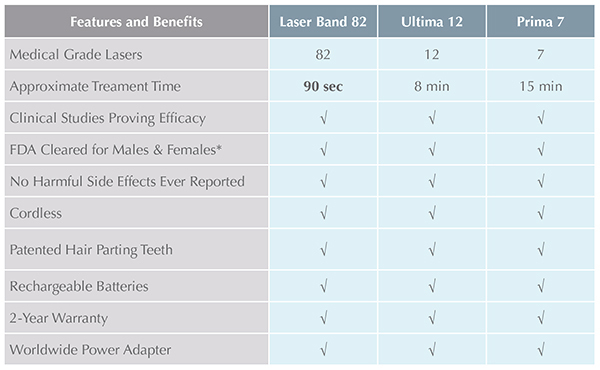 You can experience these results for yourself by using the LaserBand 82 in your home. HairMax are so confident that you will be delighted with the LaserBand that they offer a 5-month money back guarantee in the very unlikely even that you aren’t satisfied. Great results from just 90 seconds of treatment 3 times a week! Which HairMax device is right for me?